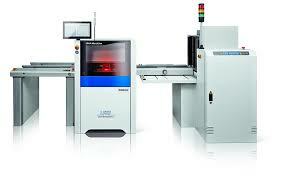 LPKF MicroLine 2000 Ci - Automated UV Laser for Depaneling of Rigid and Flexible PCBs. The MicroLine 2000 Ci systems are remarkably compact, easy to operate, with a very good price performance ratio – a welcome addition to the electronic production team. In the MicroLine 2000 Ci, a highly developed vision system is used that can make corrections in the position and rotation angle of the component. The laser beam follows the contours of the real component position. The choice of available laser sources for the MicroLine 2000 platform has been expanded by a high power option for increased cutting performance. The MicroLine 2000 Ci seamlessly integrates into existing manufacturing execution systems (MESs).